The Moscow Arbitration Court rejected the ruling of the Federal Anti-Monopoly Service of Russia (FAS) with regards to Novorossiysk Commercial Sea Port (NCSP) on the case of stevedoring tariffs, informs TASS news agency. As we wrote earlier this month, in June 2016, FAS initiated a legal action against nine stevedoring companies accusing them of abusing their monopoly power and setting excessive rates. NCSP was amongst these and was charged with violation of the competition law of Russia by setting and maintaining excessively high stevedoring rates for handling ore, fertilizers, containers, metals, oil and oil products in the port of Novorossiysk in the Black Sea. NCSP’s tariffs are set up in US dollars and due to sharp ruble devaluation at the end of 2014 their ruble equivalent grew up 2.5 times. As a result, the company’s profit rocketed twice in 2015 as compared to 2014, reasoned FAS and ruled NCSP to pay RUR 9.74 bln (USD 162.2 mln) of fines to the Federal budget. The port argued that the FAS’ conclusions concerning NCSP’s profit run counter the official financial results. Indeed, according to NCSP Group Consolidated Financial Results for the full year 2015, the NCSP’s revenue in 2015 was USD 877.2 mln which is 8.2% less than in 2014 and the net result in 2015 was the loss of USD 83.4 mln. 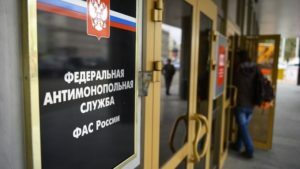 FAS initiated the competition investigation after it got complaints concerning the high tariffs in Novorossiysk from Rosneft, Russia’s leading oil extraction and refinement government-owned company. NCSP could have avoided penalties had it exchanged the handling rates into rubles. However, there have never been any legal regulations in that respect. The practice of setting stevedoring charges of NCSP in US dollars was established by the orders of the Russian Federal Service of Tariffs in 1998-2013, which has never corrected the tariffs because of US dollar exchange rate fluctuations. In 2013, the Federal Service of Tariffs abolished the stevedoring price regulation and later, in July 2015, the Service was merged with FAS. Now, the Arbitration Court has invalidated the FAS decision that NCSP violated the competition law of Russia as well as its penalty of RUR 9.74 bln.